Healthy mouth—healthy body! Research is showing that the level of health in your mouth can be a health factor for other systems throughout your body. Taking care of your mouth through proper oral hygiene can make a big difference in your smile and the way you live your life. 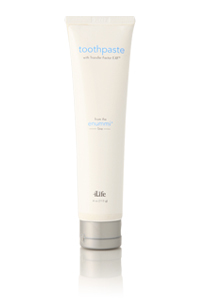 To keep your pearly whites shiny and support good oral health, use 4Life Transfer Factor Toothpaste. It offers the immune benefits of Transfer Factor E-XF™ and other ingredients, including coenzyme Q10 and lactoferrin, known to promote healthy teeth and gums. Research indicates that the health of your mouth can influence the health of other body systems. 4Life Transfer Factor E-XF helps promote the health of your teeth and mouth through superior immune system support. Xylitol is an all-natural sweetener with antibacterial qualities that inhibit the bacteria most closely associated with plaque and tooth decay. "I have had challenging dental problems in the past and have lost most of my teeth. I have been using 4Life Transfer Factor Toothpaste ever since it was introduced at Convention. When I visited my hygienist recently, she was very pleased with the condition of my gums and teeth, and said the pocket depth is good. She was very impressed with the Transfer Factor Toothpaste formula, the immune support it provides and the addition of Co-Q10. I am really excited about this new toothpaste!"